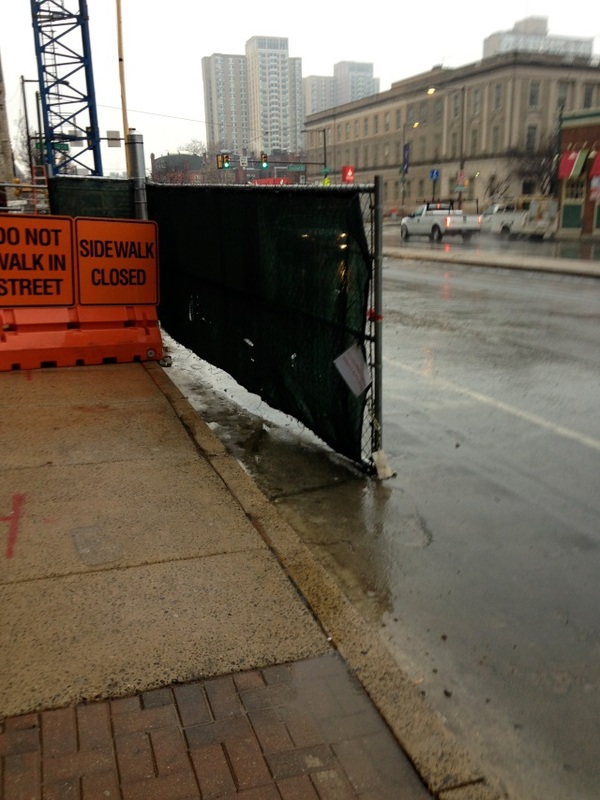 One of the most common complaints we hear at Feet First Philly is about construction projects that close sidewalks and force pedestrians to detour across the street. The prevalence of closed sidewalks seems to have increased significantly in the past few years. Yes, there are more buildings under construction, but it also seems that construction projects are being allowed to close the sidewalks, without providing protected walkways, for longer and longer periods of time. Just a few recent examples include 2nd and Arch Streets, 15th Street at Walnut, 38th and Chestnut Streets, and the newest: Market and 20th Streets. Detours are not popular with most pedestrians, especially those who are elderly, frail or disabled; those who are young and impatient; and anyone in a hurry to get to their destination; in other words, most of us, much of the time. Add to that the fact that signs are often improperly placed, as in the photo above right, on 38th Street, such that the pedestrian needs to back-track to a controlled crossing. The combined result is that many pedestrians end up walking in the travel lane along the construction zone, or crossing mid-block just where the sidewalk is closed. On a narrow street, this could be relatively safe but, on a wide street like 38th or Market Street, it is not. The City Code (11-612 (2)) sets forth a process where developers must submit an engineer’s analysis, which is then reviewed by the Streets Department, to make a written determination that a covered walkway is impracticable, before approving an application to close a sidewalk for more than a week. However, this process cannot be tracked by the public, since Street Closure Permits are not accessible via the City website. The official application to close a sidewalk does not mention the required engineer’s analysis. The Streets Department tries to encourage developers to minimize the impact on pedestrians through a staggered fee schedule, but this approach is not having the desired effect. Many developers are willing to pay the price to close both the sidewalk and the parking lane for the full length of construction. Higher fees may be needed. Currently, permits are being given to close sidewalks for long periods of time, even on major arterials such as Market Street and 38th Street, and even where there are substantial pedestrian volumes. There is no official policy to prohibit a long-term total closure of any sidewalk. We urge the Streets Department to adopt a sidewalk closure policy that gives pedestrian safety and mobility at least as high a priority as motor vehicle traffic receives. This policy should be backed up with regulations appropriate to an urban setting, such as visibility of traffic and pedestrian signals, protection of street trees, and lighting. A recent change to the Code requires signs at all construction sites that have sidewalk closure permits. The required signs are intended to improve enforcement by making it more likely the Streets Department will receive a report when sidewalks are closed without permission. Feet First Philly is asking for your help in documenting the problems of construction disruption. This will assist the Streets Department in enforcing illegal sidewalk closures, and we believe it will also help make the case for a stronger policy on protecting the pedestrian path. If there is a construction project in your neighborhood, or where you work or travel regularly, please take photos and fill out our report form. We’ll incorporate the information into our database and update it regularly. If you believe the situation is dangerous or may be illegal, you should also call 3-1-1.